With its location in the heart of the city overlooking the Amstel River, De L’Europe is synonymous with Dutch history and has been favoured by the most celebrated names. Admire exquisite replicas from Dutch Masters decorating the walls in all guestrooms at both the historical Rondeel building and the contemporary Dutch Masters Wing. Enjoy culinary highlights at the hotel’s fine restaurants and bars. Do you know exactly how to run an efficient organization, you have strong planning skills and a great feeling for gastronomy? 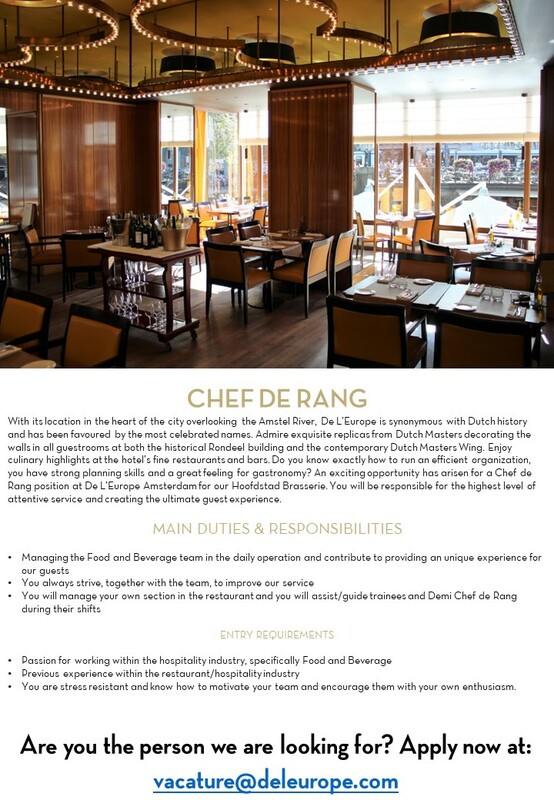 An exciting opportunity has arisen for a Chef de Rang position at De L’Europe Amsterdam for our Hoofdstad Brasserie. You will be responsible for the highest level of attentive service and creating the ultimate guest experience. - You are stress resistant and know how to motivate your team and encourage them with your own enthusiasm. De L'Europe Amsterdam, member of the Leading hotels of the World, is overlooking the beautiful Amstel River in the heart of Amsterdam and offers convenient access to several of the world's heralded museums and Amsterdam's key points of interest. Opened in 1896, De L’Europe has been favoured by Amsterdam’s elite and the world’s most celebrated names. Admire true replicas from Dutch Masters in all rooms and suites at the historical Rondeel building and the contemporary Dutch Masters Wing. Contemporary amenities and classic design blend with luxurious comfort. Traditional old-charm co-exists with historic masterpieces in the grand Promenade, where the city's most authentic High Tea is served while river views provide a breathtaking backdrop to the Michelin-starred restaurant Bord'Eau, the Bib Gourmand awarded casual Hoofdstad Brasserie with a warm-weather terrace and the authentic Freddy's Bar. Le Spa by Skins Institute you to experience a tranquil haven designed to lavishly pamper, indulge and nourish your mind, body and spirit. The spa features an indoor swimming pool, four bespoke beauty treatment rooms, variety of sauna's, fitness centre and a beauty salon for hair and make-up. It is impossible to escape the city's rich history while staying at this 19th century treasure. Expect timeless design, intimate ambiance and genuine service while celebrating the finer moments with us.